Capcom has announced plans to release all three SNES Street Fighter II titles on the Wii U's Virtual Console later this week. Street Fighter II may be the most important fighting game in history. It wasn't just a success, it also served as a template for all fighters that followed it. Even today you can very easily trace many features of any given fighter directly back to Capcom's classic. More crucially, Street Fighter II was also a massive sales success. So much so that the Super Nintendo console saw three separate iterations of the game in as many years. Despite arcades being far more prevalent than they are in our modern era, these home version of Street Fighter II served as an introduction to the series (and the fighting game genre) for many players. Now Capcom wants to tap that nostalgia vein by releasing all three SNES versions of Street Fighter II on the Wii U Virtual Console. 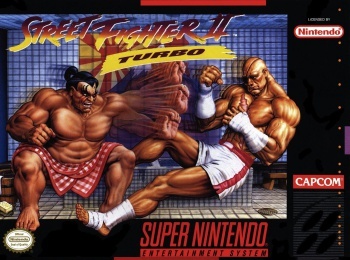 This release brings players the Super Nintendo iterations of Street Fighter II: The World Warrior, Street Fighter II Turbo and Super Street Fighter II. While Turbo effectively renders its predecessor obsolete, the good news is that you won't have to pay the full $7.99 price for each title if you pick them up en masse. According to Capcom, if you buy any of these games at their standard price point, the other two Street Fighter titles will automatically be reduced in price by 50 percent. Unfortunately, due to Nintendo's fluid update schedule, we can't tell you exactly when these games will appear on the Virtual Console, but we can point out that these versions of the games should be better than their original SNES releases. Not only does the Wii U Virtual Console allow players to save the state of their games at any time, but you're also given the option to play these titles on your television or the Wii U GamePad. The big question now becomes, "Who exactly is the audience for these games?" Is Capcom banking on nostalgic fighting game fans like myself to buy all three games, or is there a hope that these titles will appeal to new players? By modern standards Street Fighter II is an antiquated game, and since copies of Super Street Fighter IV are plentiful and cheap, I don't know how large an audience these releases might have. Then again, nostalgia is a powerful beast. Is anyone else buying all three purely to satiate their inner child?